Midland hand surgeon, Matt Brown, MD offers a wide range of treatments and surgical procedures for the hand and wrist and treats patients of all ages at the Hand Clinic at Midland Plastic Surgery Center. He reached out to Rosemont Media to develop a small specialty website dedicated to his practice. The resulting responsive design microsite includes custom content, cutting edge design features, advanced functionality, and a secure contact form all within a single page—perfectly suiting his needs. The page features parallax scrolling, which allows visitors to browse vertically through sections of informative content that float over a beautiful collage of hand-themed photos. The content displayed throughout the page introduces visitors to the Hand Clinic at Midland Plastic Surgery Center, provides information about Dr. Brown’s education and certifications, and details the specific treatments and surgical procedures he performs. The responsive design enables the website to function and be viewed on mobile and stationary Internet-connected devices alike. 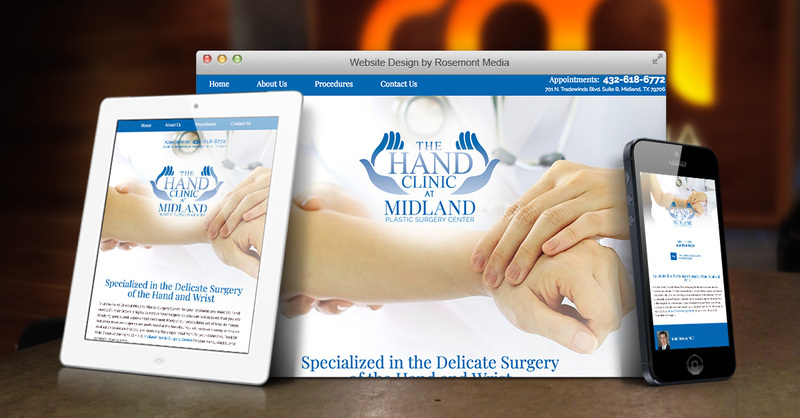 To see an example of a state-of-the-art medical website made by Rosemont Media, please visit www.midlandhandsurgery.com.